Here's Dotty, the tattoo artist. We have always been fascinated with the smiling big woman in the old photos. 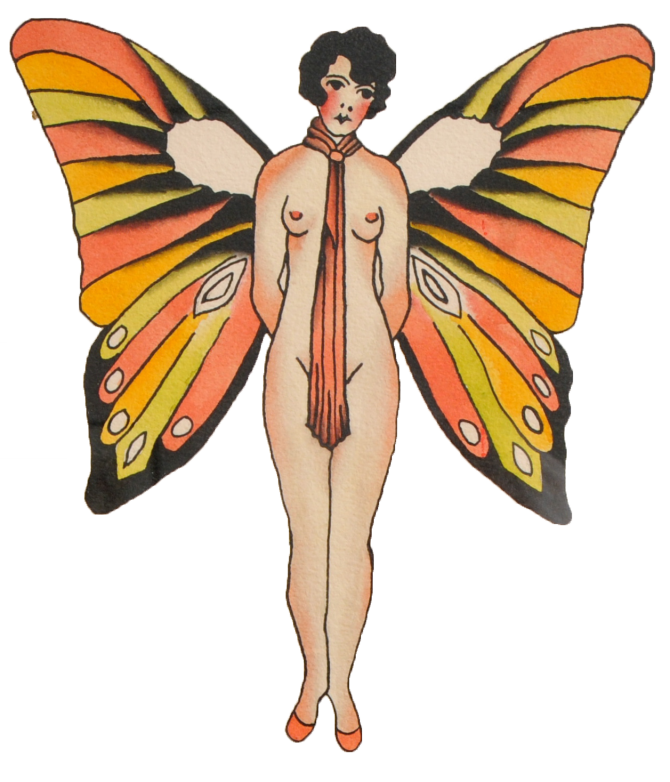 One of her designs depicted a woman with butterfly wings floating as if in liberation. 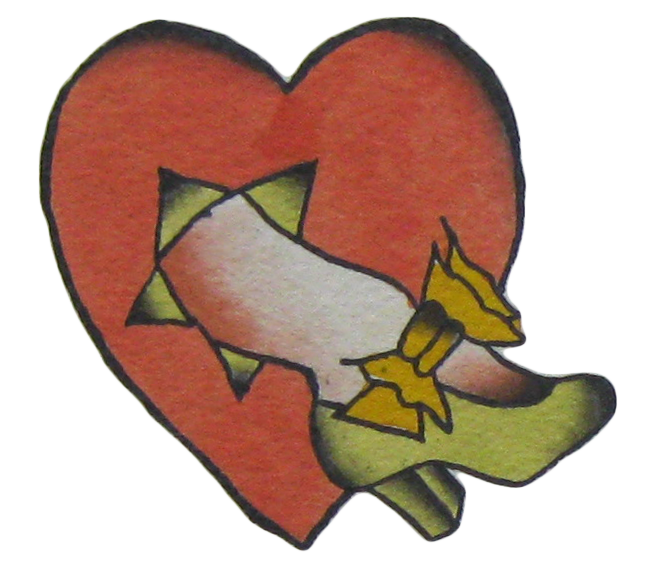 She also had her day with the classic "Put her ol' foot through me heart, matey" tattoo image. Could this have been in sympathy for Major Mite? In 1942, Dainty Dotty, who would be Owen Jensen's future wife, worked with Major Mite (world's smallest man) at the Ringling Brothers Circus. Although they were on the circuit together, "America's Greatest Individual Attraction" apparently never won over the big lady. Major Mite was still with Ringling throughout the 1940's until dejected, he slumped back to Portland Oregon to be near his family. More of this story has to yet be uncovered. Its hard to say if Dainty Dotty knew Owen Jensen in 1942. He was in traveling back and forth between Norfolk, VA and Michigan, were she she met him. By 1944, she was working at the Palace of Wonders in Detroit as a "fat gal." She probably grew tired of folks pointing at her and laughing. Rightly so. This would seem to be a tough road to go down. 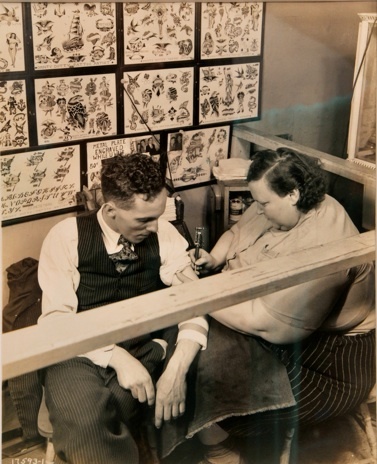 She might have watched the dapper tattooist and thought this looked a little more genteel than her current employment. In 1945, Dot and Owen married, loaded up the black, five window Ford coupe and joined the great migration for the sunshine state, California. 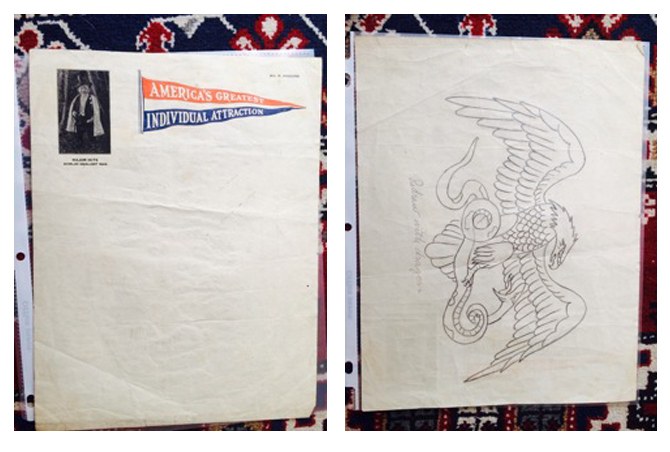 Major Mite letterhead with tattoo eagle drawing on back. Keep tuned for more on Dotty. Thanks to Carmen Nyssen for her research.